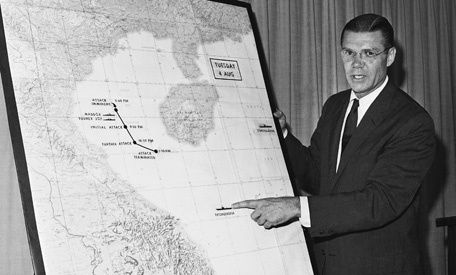 Bob Schutz/AP Secretary of Defense Robert S. McNamara in a post-midnight press briefing at the Pentagon points out action in Gulf of Tonkin, Aug. 4, 1964. On Aug. 7, 1964, Congress passed the Gulf of Tonkin Resolution based on what is now widely believed to be faulty intelligence, plunging the United States into the Vietnam War. They launched the covert Operation 34A, which called for the U.S. Navy to conduct raids off the coast of North Vietnam. Separately, the Navy also carried out surveillance operations; part of the operation was the USS Maddox, a navy destroyer that began reconnaissance missions northwest of the South China Sea, in the Gulf of Tonkin, on July 31, 1964. On Aug. 2, in retaliation for an OPLAN-34A raid on July 31, three North Vietnamese torpedo boats attacked the Maddox. The torpedoes missed, and only a single machine gun round hit the American destroyer. On Aug. 4, the Maddox and the USS Turner Joy returned to the gulf, anticipating another attack. That night, the Turner Joy picked up high-speed vessels on its radar, but the Maddox did not. The two destroyers fired on the supposed ships, though there was confusion whether there were actually attackers. What Happened and What Did Johnson Know? Many historians and opponents of Johnson have charged the attack was a fraud used as propaganda to win support for the war. In a report for NPR, Walter Cronkite argued that McNamara planned for the attack. He cites a conversation that occurred just hours before the attack in which McNamara explained the situation to Johnson. “He didn’t say ‘could be attacked’ or ‘might be attacked,’ he said ‘to be attacked tonight.’ Washington was clearly laying bait for the fox. American bait to justify American retaliation,” said Cronkite. Hanyok does not believe that there were political reasons for the NSA’s actions. Rather, he believes that mid-level NSA agents distorted evidence to cover up earlier mistakes. Furthermore, he found no evidence that Johnson or any White House official knew or condoned the skewed evidence. Pentagon historian Edward J. Drea, writing in MHQ: The Quarterly Journal of Military History, describes the confusion among White House officials in the days surrounding the attack. He contends that the Johnson administration felt forced to make a quick and decisive response that was influenced by unreliable information and a pattern of North Vietnamese aggression. Hanyok’s report was released to the public in 2005 as part of the declassification of more that 140 top secret NSA documents, including histories, intelligence reports and interviews. Johnson was elected in 1960 as vice president to John F. Kennedy and became president three years later after the assassination of President Kennedy. Johnson was in the midst of a contentious presidential race against Republican nominee Barry Goldwater when the Gulf of Tonkin incidents occurred. He would go on to win the election with over 60 percent of the electoral vote. Throughout his presidency, American involvement in Vietnam drastically increased. As the war dragged on with end in sight, Johnson lost the support of the American people. During the Democratic primaries for the 1968 election, a beleaguered Johnson pulled out of the race.